tags: It's not the armor that makes the hero, but the man inside. Now that Tony Stark has revealed to the world that he is Iron Man, the entire world is now eager to get their hands on his hot technology - whether it's the United States government, weapons contractors, or someone else. That someone else happens to be Ivan Vanko - the son of now deceased Anton Vanko, Howard Stark's former partner. Stark had Vanko banished to Russia for conspiring to commit treason against the US, and now Ivan wants revenge against Tony - and he's willing to get it at any cost. But after being humiliated in front of the Senate Armed Forces Committee, rival weapons contractor Justin Hammer sees Ivan as the key to upping his status against Stark Enterprises after an attack on the Monaco 500. But an ailing Tony has to figure out a way to save himself, get Vanko, and get Hammer before the government shows up and takes his beloved suits away. And can he figure out what a mysterious figure named Nick Fury wants with him? After Tony Stark announces to the World that he's Iron Man. He faces many problems in his Life, His Lifesource is Poisoning him, The US Government wants his tech, and someone's out to kill Stark. That Someone is Ivan Vanko, Son of Anton Vanko who worked with Tony's Father Howard, But Howard then sent Anton to Russia. Ivan trys to kill Tony Stark at a Grand Prix in Monaco but Ivan is then arrested. However Tony's Rival Justin Hammer helps Vanko escape from Prison and Hires Vanko to create to Suits similar to Tonys. Tony also assigns his Assistant Pepper Potts as CEO of Stark Industries. It's now up to Tony to defeat Ivan and Hammer and to fix his Arc Reactor before he can die. Depending on your point of view, my summary line by Iron Man/Tony Stark either describes the picture pretty well or not at all. That would have been the best line of the picture if Justin Hammer (Sam Rockwell) hadn't of come up with "This is a kinetic-kill, side-winder vehicle with a secondary cyclotrimethylenetrinitramine RDX burst". And I always though antidisestablishmentarianism was the longest word in the English language. 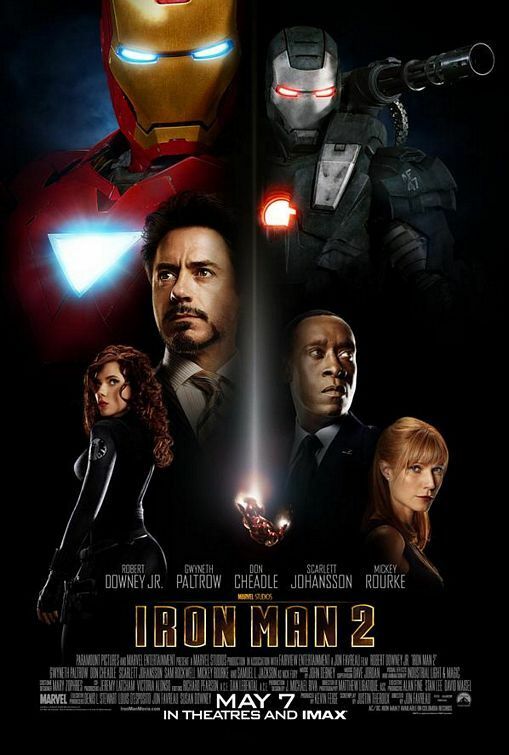 I'm echoing a lot of viewers who thought more of the first Iron Man flick than this one. Too much emphasis on the special effects and blow 'em up action and not enough on character development and motivation. At least they mentioned War Machine by name, or I should say Don Cheadle mentioned it. But how does anyone know who Black Widow is unless you follow the comic book series? Mickey Rourke looks every bit like he might have just stepped off the set of "The Wrestler", and as I think about it now, I don't think there ever was a pro grappler named Whiplash. I wonder why. The one thing I always look forward to in my Marvel Comics films is the manner in which writer and comic book legend Stan Lee shows up. Just as in the first Iron Man picture, Mister Lee is credited as himself, but is actually shown and introduced portraying Larry King in a quick early scene. The first time around he was doing the Hugh Hefner thing. The Fox News Network's Bill O'Reilly also gets some face time here in a background sequence doing one of his Talking Points Memos on Pepper Potts. I'm thinking about that now, and how his appearance neatly ties into the pro-American, patriotic stance the picture takes with Iron Man's character and Tony Stark's refusal to give up his personal private property, both very conservative viewpoints. O'Reilly goes after Pepper Potts' inexperience in being named the head of Stark Enterprises, and it seems I've heard that argument before about a certain President.